Police officers frequently cite motorists arrested for DUI in Los Angeles for related offenses such as speeding and running red lights. 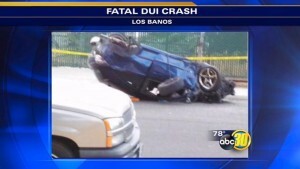 In Los Banos, California, one motorist’s behavior recently resulted in another far more grievous charge—vehicular manslaughter. ABC 30 reports that 20-year-old Marcus Perez-Negrete and 19-year-old Casey Giannone had spent the evening drinking before they decided to top off the night with a little street racing. They sped down Santa Rita Avenue; when Negrete got to the stop sign at D Street, he allegedly didn’t bother to stop. As Perez-Negrete’s blue Saturn Astra barreled through the intersection, it struck a red Chevy Aveo. The Astra flipped over, landing on its roof. Perez-Negrete walked away from the crash; so did his passenger. Although the 64-year-old driver of the Aveo survived the crash, his 61-year old passenger and co-worker wasn’t as lucky. He died from his injuries. The two men had double bad luck that day; they couldn’t work at their picking jobs, because the field was flooded, and their unplanned return home put them right in the path of Perez-Negrete’s car. The crash startled people living along the quiet street, waking them with a noise that one resident described as sounding like a bomb exploding. Police wasted little time in sizing up the situation and taking Perez-Negrete to jail. They charged him with driving under the influence and with vehicular manslaughter. The court set his bond at a substantial $400,000. While his street race competitor didn’t face the manslaughter charge, cops charged her with DUI, reckless driving and driving without a license. Locating a seasoned and qualified Los Angeles DUI defense lawyer is a critical part of the process of reclaiming your life, your time and your peace of mind. Call ex-prosecutor Michael Kraut for a free consultation right now. If you’ve been arrested for driving under the influence in Los Angeles, contact former-prosecutor Michael Kraut for assistance at (323) 464-6453 or online. Our team is located at 6255 Sunset Boulevard, Suite 1480, Los Angeles, California 90028.